This model fitted into the Beogram range just below Beogram 3000. 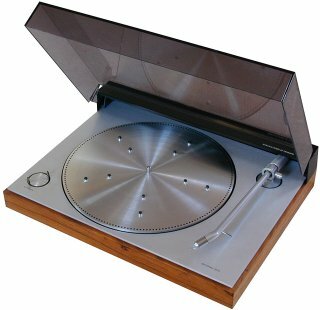 It looked fairly similar, the main visual differences being the fitting of a platter with “pegs” to hold the record (similar to the Beogram 1200 series type) and that the part of the lid that housed the hinge was black instead of silver (a traditional B&O method of denoting the “basic” and “posh” version of similar looking models). It was designed to go with the Beomaster 2000, and these two items, along with a pair of loudspeakers such as Beovox 2702 and the Beocord 2200 cassette recorder formed a mid-range Hi-Fi system capable of very pleasing results. Text copyright © Beocentral. Unauthorised reproduction prohibited. The Beogram 2000 retained the same controls as Beogram 3000, though inside they operated purely mechanically through a simplified lightweight mechanism, as opposed to the 3000 arrangement (which was first seen on Beogram 1202) which was partly electrical and employed a special relay. The platter was also slightly different to previous 1200 models as the built-in centre for 45 rpm records was no longer fitted. Finally, the cast sections of the sub-chassis that had helped reduce the sensitivity of the Beogram 1202 and 3000 to external vibrations were not fitted. Text copyright © Beocentral. Unauthorised reproduction prohibited. The Beogram 2000 was replaced when a new range of slimmer machines appeared that used the MMC X000 series integrated pickups. The model that took over directly from Beogram 2000 was Beogram 1100. Text copyright © Beocentral. Unauthorised reproduction prohibited.